Wal-Mart has launched an Online Resource Guide, "Save More". 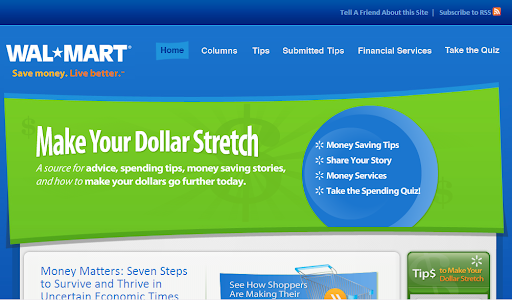 Wal-Mart launches today a new on-line platform for customers hungry for ideas to stretch their dollars during tough times. The site, located at http://www.walmart.com/savemore, will feature tips and advice from Ellie Kay -- America's Family Financial Expert® and best-selling author of 11 books including her most recent release, A Tip A Day With Ellie Kay. With 20 years of financial experience, Ellie has appeared on numerous television and radio talk shows speaking about practical ways in which women, families and children can better understand how to save and spend their money. Her advice will serve as a resource for budget-conscious shoppers looking for tips and tools as they face a summer of rising costs for gas, food and other necessities. In addition, Wal-Mart merchants and everyday shoppers will have the ability to contribute content to the site by offering their own ideas on how to spend wisely and save more money. Over the last six months, nearly half of Americans say they have tried to become more practical in their purchases and more budget conscious. Tough times calls for Innovative ideas. The site allows for users to share their tips also, although I am unable to see user shared tips so far. All in all a good way to engage consumers. Making sure that they know, Wal-Mart cares for them in these tough times. No wonder Same-store sales are up.